Jung-Hoo Kim, a Korean-born artist working in America, created Long Trip in 1986 for an exhibition at SUNY New Paltz called “Color in Context”. 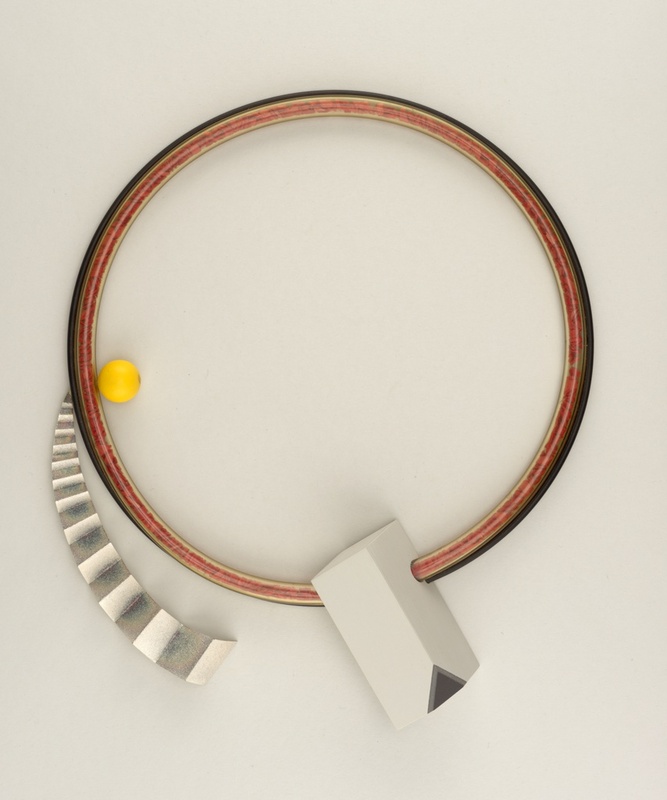 This necklace, composed of a plastic called ColorCore, sterling silver and rubber, is industrial in construction and playful in color and form. Kim’s necklace fits into the contemporary jewelers’ rhetoric, which questions what jewelry is and can be by exploring new frontiers in material use. “Color in Context” was sponsored by the Formica Corporation, who invited both the students and faculty at New Paltz to participate in creating their work from Formica’s newest laminate material, ColorCore. ColorCore represented a new frontier in plastic, as it was saturated in color, not merely superficially coated. This material was a truthful substance that was not attempting to imitate the appearance of wood or marble like its predecessors. The exhibition, like a few before it, encouraged its participants to engage with the new material without any attachment to a specific mode of design or taste. Formica is similar to contemporary jewelry in the way that it is difficult to define where it belongs. Before aligning the brand with famous artists and designers to reestablish its use, Formica was generally relegated to the domestic sphere. Formica and contemporary jewelry both oscillate between high and low culture, art and design, ornament and function. This particular attribute makes it difficult to place the material and the discipline but allows a lot of room for experimentation, which plays out in this partnership. Long Trip, as well as the pieces that accompanied it in the exhibition, functioned as adornment but were also small-scale sculptural studies in design. Kim’s wonderful use of bold yellow and red juxtaposed by cool silver and grey along with the visually interesting use of texture engages a viewer on many levels. However, the piece was never actually sold or used as a functional piece of jewelry, as it was acquired by the Cooper Hewitt just after being exhibited. “Color in Context,” offered Kim an opportunity to explore her style of design in a new country, adopting an American sensibility with the use of new materials unconstrained by her own culture’s aesthetic expectations. Susan Grant Lewin, Formica and Design: From the Counter Top to High Art (New York: Rizzoli, 1991), 146-49. Long Trip Necklace; 1986; Jung-Hoo Kim (Korean, born 1959); Colorcore, molded rioba plastic, painted acrylic, sterling silver, rubber; Gift of Jung-Hoo Kim, 1987-55-1.